Our unique concentration in medical humanities encompasses all four years of medical school and confers a special designation and dean recognition upon graduation. 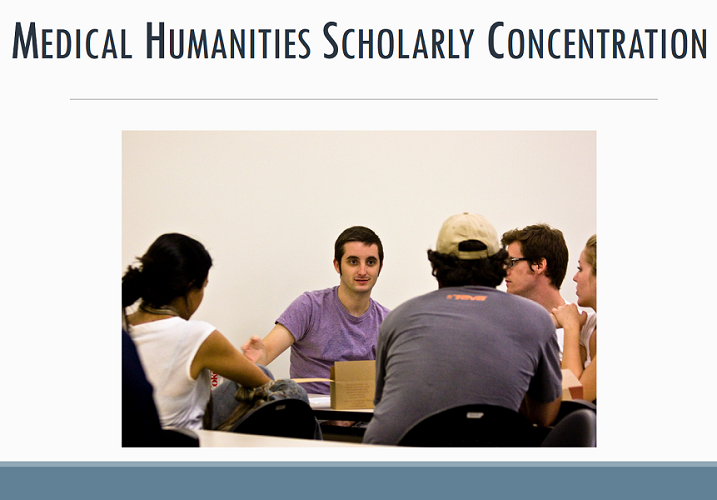 Our program is also a recognized member of the Scholarly Concentrations Progam. The McGovern Center for Humanities and Ethics offers a Medical Humanities Scholarly Concentration that provides medical students with the opportunity to enrich their medical education by means of study and involvement in the humanities. Opportunities include participation in courses, seminars, community outreach opportunities, writing workshops, and research projects. Medicine is both an art and a science. By exploring medicine through the lenses of history, ethics, law, literature, philosophy, religion, sociology, anthropology, political science, economics, cultural criticism, and the arts (such as photography, drawing, painting, and music), students gain insights into the human condition—especially experiences of suffering. Students inquire about the responsibilities of individuals and communities to one another in sickness and in health. Students also learn to cultivate the most important instrument of healing: Their individual selves. Thus, drawing on the tradition of the humanities, students learn to direct their own self-development. Many medical schools have electives and special service learning activities designed to enhance students’ medical training. Few, if any, have a certificate program that encompasses all four years of medical training with structured programs and learning opportunities that allow students to reflect, share, and work together to enhance their individual and collective capacities to see and care for the patient, not simply the disease. Students completing this program receive special designation on their permanent transcript, in their Dean’s letter, and at graduation as a John P. McGovern Humanities Scholar. They will also have the opportunity to present research papers at various venues in the Texas Medical Center and at national meetings. To assist students in becoming culturally competent, ethical, and compassionate caregivers. Can the institution of medicine continue to take advantage of the benefits of science and technology, without losing its own human essence? We believe that medicine exists in the truest sense when science, technology, and the craftsmanship of the physician are applied with the deepest respect for the humanity of the patient.